This 10 meter cable has a 6-pin Hirose plug on one end and leadwires on the other. It is used to access the super-fast general purpose I/O on Basler Ace USB cameras, via pins 1 and 3. It cannot be used to access the more noise immune optically-isolated I/O on Basler cameras. 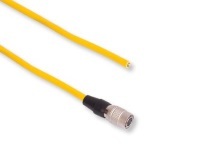 The CEBR100 cable can be used as a substitute. However, the CEBR100 only has one ground conductor connected to pin 6. The CEBR115 has two ground conductors connected to pin 6 for a slightly improved signal-to-noise ratio. See the document on the Resources tab for conductor pin-out information.